The top Republican in Congress blasted Democrats’ No. 1 legislative priority, calling their bill to reform elections and increase voting access a “power grab” because of the new perks it provides to federal employees. The 2019 For the People Act (H.R. 1) would, among an array of other changes, make Election Day a federal holiday and enable federal workers to take up to six days each year to serve as a poll worker and receive training for that job. 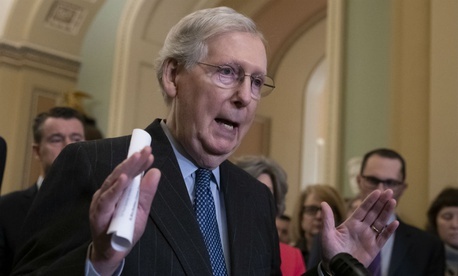 Senate Majority Leader Mitch McConnell took issue with both of those provisions, alleging that feds would use their new responsibilities nefariously. McConnell went on to say that Democrats were pushing the new leave category, which would be limited strictly to poll worker activities, to enable feds to work on their campaigns. Agencies have come under fire for election-related leave in the past. Postmaster General Megan Brennan announced in 2017 that U.S. Postal Service employees could no longer take unpaid time off to campaign for political candidates following an independent investigation that found the mailing agency engaged in “systemic violations” of the Hatch Act that led to an “institutional bias” in favor of certain candidates. That law prohibits federal employees from engaging in certain political activity while on the clock or in an official capacity. The Office of Special Counsel reported the Hatch Act violations after the USPS inspector general found the agency spent $90,000 on overtime to cover for employees who took time off to campaign in advance of the 2016 election. A third-party arbitrator ruled last year, however, that USPS must rescind the policy in advance of the 2018 midterms because it violated USPS’ collective bargaining agreement. The new legislation does not create any new leave for campaign activity, however. The legislation would place new restrictions on federal workers before, during and after their government service, with special obligations for senior officials and the president. All federal employees would face a ban on using their official positions to participate in matters related to their former employers. Violators would face fines and one-to-five years in prison.